A joint land purchase of 98 acres of land near Dead Horse Mountain Road. Rezoning 0.22 acres at 510 S. College Ave.
Rezoning 0.16 acres at 1924 S. Ashwood Ave.
Rezoning 2.16 acres at 1540 E. 15th Street. Rezoning 0.93 acres at 509 W. Prairie Street. Changing the composition of the Fayetteville Arts Council and the Town and Gown Advisory Committee. Changes to the Non-conforming Access Features code. 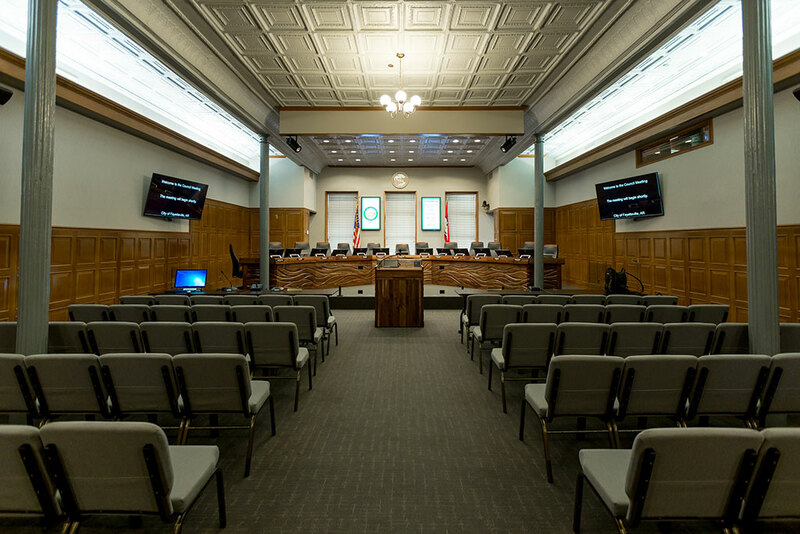 A meeting of the Fayetteville City Council began at 5:30 p.m. Tuesday, April 16, 2019 inside room 219 of City Hall, located at 113 W. Mountain St. in Fayetteville. Consent items are approved in a single, all-inclusive vote unless an item is pulled by a council member at the beginning of the meeting. 2. Bid #19-19 O’reilly Auto Parts (Details): A resolution to award Bid #19-19 and authorize the purchase of oil, air, and fuel filters from O’reilly Auto Parts for varying unit prices as needed for a term of one (1) year with automatic renewals for up to four additional one-year terms. 3. Boston Mountain Recycling Grant (Details): A resolution to authorize acceptance of a 2018 Arkansas Department of Environmental Quality grant through the Boston Mountain Solid Waste District in the amount of $7,000.00 for a compost bin sale, and to approve a budget adjustment. 4. Ranger’s Pantry Donations (Details): A resolution to approve a budget adjustment in the total amount of $50.00 representing donations to Ranger’s Pantry. 5. Yvonne Richardson Community Center Summer Fun4Kids Program (Details): A resolution to approve a budget adjustment in the amount of $4,056.00 representing a donation from Friends of YRCC to fund a paid summer internship opportunity with the Yvonne Richardson Community Center Summer Fun4Kids Program. 6. United States Postal Service Lease Amendment (Details): A resolution to approve a lease amendment with the United States Postal Service for the terminal space located at 4500 S. School Ave., Suite P to extend the term of the lease through February 16, 2025, for annual rent in the amount of $27,648.00. 7. EPA Region 6 Wetland Program Development Grant Application (Details): A resolution to authorize an EPA Region 6 Wetland Program Development Grant application in the total amount of $500,000.00 for restoration of Tanglewood Branch within the Cultural Arts Corridor. 8. Bid #19-28 Scurlock Industries (Details): A resolution to award Bid #19-28 and authorize the purchase of precast concrete box culverts from Scurlock Industries in the amount of $51,821.50 plus applicable taxes for a tunnel crossing under Old Wire Road on the Niokaska Creek Trail. 9. Amend Resolution 39-19 (Details): A resolution to amend the 2019 budget by reducing the amount of reappropriations from the 2018 budget by $2,532,487.00. 10. RFQ #19-01 Garver Engineers, LLC (Details): A resolution to approve a professional engineering services agreement with Garver, LLC, pursuant to RFQ #19-01, in the amount of $246,450.00 for the engineering design of waterline replacements along South Garland Avenue and East Rolling Hills Drive, and to approve a budget adjustment. A resolution to approve a land purchase, use and conservation contract with the Watershed Conservation Resource Center for the joint purchase of about 98 acres of land near Dead Horse Mountain Road for the amount of $250,000.00 plus closing costs, with the city’s portion of the costs not to exceed $160,000.00. The Watershed Conservation Resource Center and the city have expressed mutual interest in conserving about 98 acres of land abutting Dead Horse Mountain Road. The plan is to restore the stream banks that lead to the Beaver Lake watershed to improve the water quality, and to eventually build a public trail along the river, a canoe/kayak access point, and construct a bird and butterfly park that supports the bird and Monarch butterfly habitats. The council voted unanimously to approve the resolution. A resolution to approve the tenth amended interlocal agreement for jail services with Washington County, Arkansas for continuing fees of sixty-two dollars ($62.00) per booked prisoner for 2019. This resolution would extend the term of the agreement the city holds with the county jail, but would keep the price the same for each inmate booked into the facility. 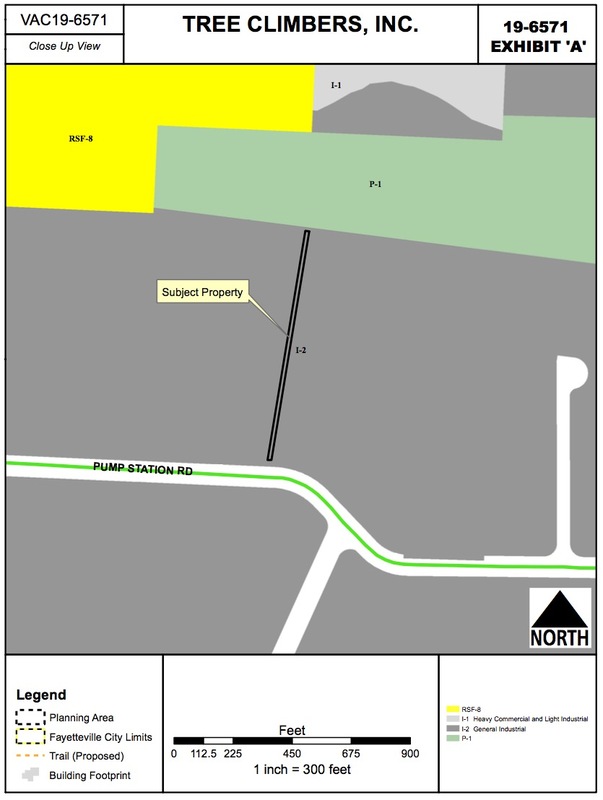 An ordinance to waive the requirements of formal competitive bidding and approve a cost-share agreement with Baumann Construction, LLC for the installation of sewer main along a portion of South School Avenue between West South Street and South Archibald Yell Boulevard, with the estimated amount to be paid by the City of Fayetteville not to exceed $37,189.38, and to approve a project contingency in the amount of $3,720.00. Baumann Construction would like the city to share in the cost of extending an 8-inch sewer line for approximately 277 linear feet. The proposed line would extend east from an existing 8-inch sewer line on South School Avenue, run north parallel to the existing line for approximately 100 feet, then extend east into property where three townhomes are planned. Aside from the townhomes, the infrastructure would also support any other new developments in the area. Council Member Kinion said the Water, Sewer and Solid Waste Committee discussed this request and determined that a cost share in this location is mutually beneficial because the city would likely need to extend this particular sewer line at some point in the future anyway. There was no public comment. The council voted unanimously to approve the ordinance. An ordinance to waive competitive bidding and accept a quote in the amount of $31,503.35 plus applicable taxes from Riggs Power Systems for the replacement of an exhaust catalyst on the backup generator at the Noland Wastewater Treatment Facility, and to approve a budget adjustment. Recent inspections of the Noland Treatment Facility’s 2,000-kilowatt generator system found that the generator’s diesel oxidation catalyst is in need of replacement to meet EPA standards. The generator’s catalyst reduces the amount of carbon monoxide released in the atmosphere, and staff said replacing it will ensure compliance with EPA air quality standards. Kinion said there wasn’t much discussion about this at the Water, Sewer and Solid Waste Committee because it simply must be done, and Riggs is the supplier of the necessary part. There was no public comment. An ordinance to rezone that property described in rezoning petition RZN 19-6553 for approximately 0.22 acres located at 510 S. College Ave. from NC, Neighborhood Conservation to NS-L, Neighborhood Services-Limited RI-U, Residential Intermediate-Urban. The Planning Commission recommends approval of the request, but city planning staff disagree. The undeveloped 0.22-acre property is located on the east side of College Avenue between 5th Street and MLK Jr. Boulevard, and is zoned NC, Neighborhood Conservation. The applicant stated that the rezoning is needed to allow businesses, home occupations, and two-, three-, or four-family dwellings. 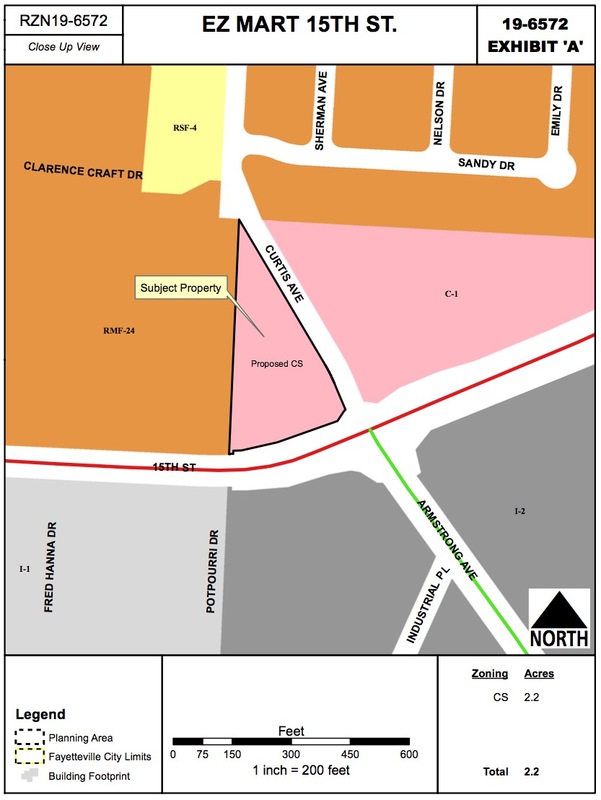 City staff said the potential build-out of the NS-L zoning does not reflect the existing community character of the surrounding neighborhood that is fully built out with primarily small single-family buildings, and that infill can be more appropriately accomplished on this property using existing tools in the current NC zoning such as accessory dwelling units or a conditional use permit for limited business. Council member Sarah Marsh was not present at the meeting, but asked that the item be held on the first reading. The applicant said they’d like to change their request to RI-U, Residential Intermediate-Urban instead of NS-L. They said the reason is because it’s a district that city planning staff are in favor of, and they could change their plans to fit within that district’s requirements. Council member Sloan Scroggin moved to amend the ordinance to RI-U instead of NS-L. The amendment passed 7-0. Council member Matthew Petty said he’s in favor of the amended request, but said he doesn’t understand why staff thinks NS-L is incompatible with the surrounding properties, considering there are several non-residential uses within a block of the subject property. The item was left on the first reading. The discussion will continue on May 7. 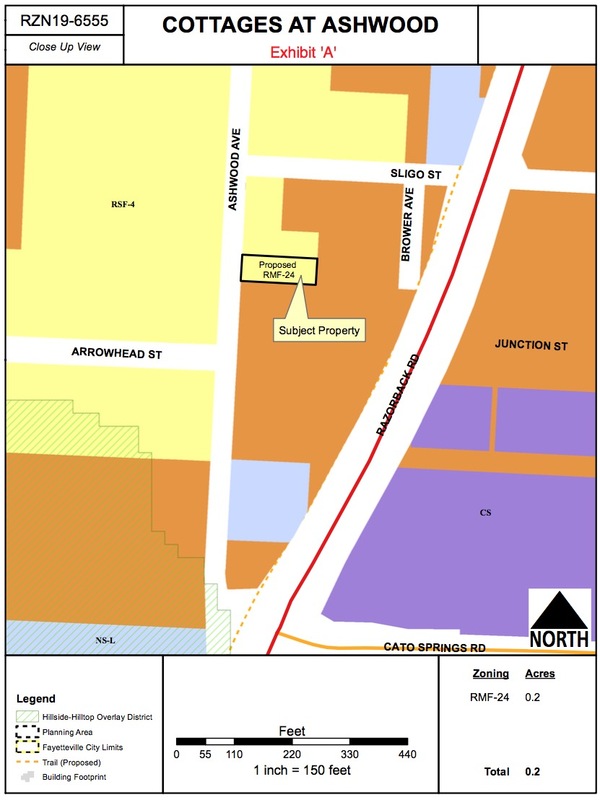 An ordinance to rezone that property described in rezoning petition RZN 19-6555 for approximately 0.16 acres located at 1924 S. Ashwood Ave. from RSF-4, Residential Single Family, 4 units per acre to RI-U, Residential Intermediate-Urban. The 0.16-acre property includes one single-family home, and is located on the west side of Ashwood Avenue between Sligo Street and Arrowhead Street within the Fayette Junction Neighborhood Plan area. The applicant stated that the rezoning is needed to allow new development. City staff said the proposed district is not compatible with the surrounding area because it could result in a large increase in potential building footprint and parking area in the middle of an established and stable neighborhood that is built mostly to RSF-4 requirements. Staff said the lot is currently developable under the existing RSF-4 district, and could fit two accessory dwelling units on the property alongside a single-family home. The property owner said the existing house is damaged beyond repair and he believes his only option to keep from losing money is to remove the home and replace it with some type of multi-family structure. Sue Madison, who does not live nearby, but has owned several homes in the neighborhood, said a multi-family development in the area is incompatible because it would compromise the character of the older neighborhood. A second person spoke, who lives in the neighborhood, and agreed with the first speaker. She also said she’s concerned about traffic safety because of the additional cars the development could bring. Council member Gutierrez agreed with the two speakers and said she would not support the rezoning request. Mayor Jordan, who lives nearby, said he’s also concerned about the request because of the small size of the lot and the narrow street. He said parking would be difficult to fit, and he doesn’t think the request is compatible with the neighborhood. Council member Kinion said the current zoning would allow a duplex with a conditional use permit, so there is a way for the property owner to move forward. Council member Petty said the property is actually too narrow to allow for a duplex, unless the Board of Adjustments also approves a variance. He said the likelihood of both the variance and conditional use permit being approved is slim. He said the width of the lot isn’t even compatible with the current zoning, so he’s confused why city staff doesn’t have an option for the applicant that would allow him to build what he wants instead of leaving him with only one choice – rebuilding the home, which he said wasn’t financially feasible. Staff said they’d likely be in favor of RSF-8, and that option could be explored more by both staff and the applicant if the council were to leave the item on the first reading. The council agreed, and the discussion will continue on May 7. An ordinance to rezone that property described in rezoning petition RZN 19-6572 for approximately 2.16 acres located at 1540 E. 15th Street from C-1, Neighborhood Commercial to CS, Community Services. Both the Planning Commission and city planning staff are in favor of the request. The 2-acre property includes a gas station and convenience store at the northwest corner of 15th Street and Curtis Avenue. On April 6, 1982, the council approved a rezoning of the land from R-O, Residential Office, to C-1, Neighborhood Commercial, subject to a Bill of Assurance which limits the use of the property to a gas station, convenience store and car wash. In April 2018 the property owner requested that the City Council remove the Bill of Assurance to facilitate the sale of the property. The City Council denied the request and discussed a preference to rezone the property to a form-based zoning district, which is what is now being requested. A representative for the applicant said a sale is pending on the property, and asked the council to consider making a decision tonight. She said the applicant has requested exactly what the council has previously said they wanted for the property. The council advanced the ordinance to the third and final reading, and unanimously approved it. 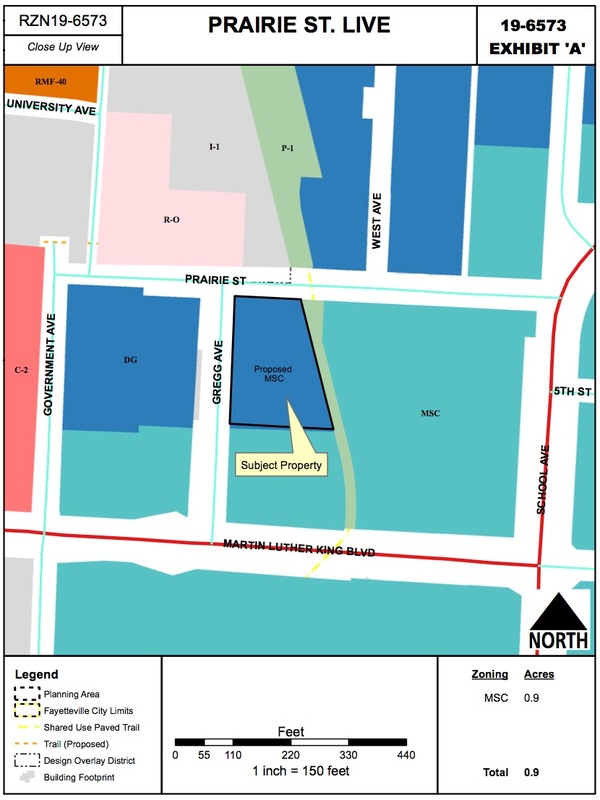 An ordinance to rezone that property described in rezoning petition RZN 19-6573 for approximately 0.93 acres located at 509 W. Prairie Street from DG, Downtown General to MSC, Main Street/Center. The 0.93-acre property is on the southeast corner of Gregg Avenue and Prairie Street, with the Frisco Trail bordering its eastern boundary. It is developed with one 1,700-square-foot industrial building built in 1930 and multiple accessory structures, including one that has the appearance of a stage. Although formerly a part of Fayetteville’s downtown industrial area, it has since transitioned, first to a skateboard shop and park with occasional indoor live music, and now to an events venue. The property was rezoned to its current DG, Downtown General, zoning district as a part of the Downtown Master Plan in October 2006. The applicant stated that the rezoning is needed to allow the new event venue the opportunity to apply for a conditional use permit for outdoor music. Staff said the request is also in line with the Downtown Master Plan. Council member Petty recused himself from the discussion because he said he owns property within 100 feet of the subject property and he would be directly affected by the rezoning. Turk said she hopes the property doesn’t close off access to the adjacent trail. Gutierrez said she’s talked with the applicant who told her the goal would be to engage trail users. Both Kinion and Bunch said they have concerns about the parking situation in the area. Scroggin asked city staff if there’s a difference between the current and requested district when it comes to parking (the answer was no). The council agreed to leave the ordinance on the first reading. The discussion will continue on May 7. An ordinance to approve VAC 19-6575 for property located at 2090 W. Henson Hill to vacate a portion of a utility easement. Any relocation of or damage to existing utilities or existing facilities shall be at the owner/developer’s expense. 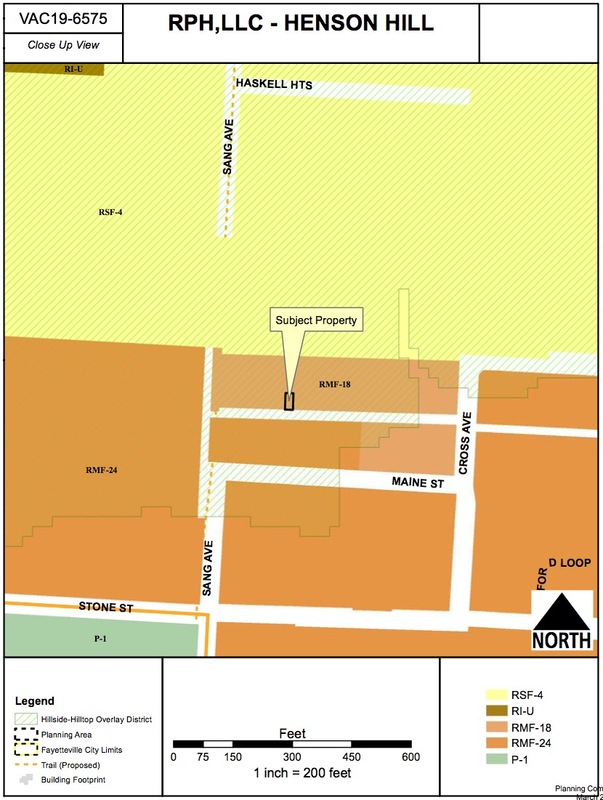 The property is located on the south slope of Markham Hill, just west of the intersection of Nettleship Street and Cross Avenue. It was rezoned to RMF-18 in 2015 and a large-scale development was approved in 2017, which is currently under construction. The applicant said that the vacation is needed to accommodate a minor shift in the building layout necessitated by building code. An ordinance to approve VAC 19-6571 for property located at 1248 E. Pump Station Road to vacate a portion of a utility easement. The property is zoned I-2, General Industrial, and is located on the north side of Pump Station Road between Morningside Drive and Industrial Drive. It is currently undeveloped and partly covered in a floodplain. An ordinance to approve VAC 19-6574 for property located at 1270 & 1272 North Corsica Drive to vacate a portion of a utility easement. 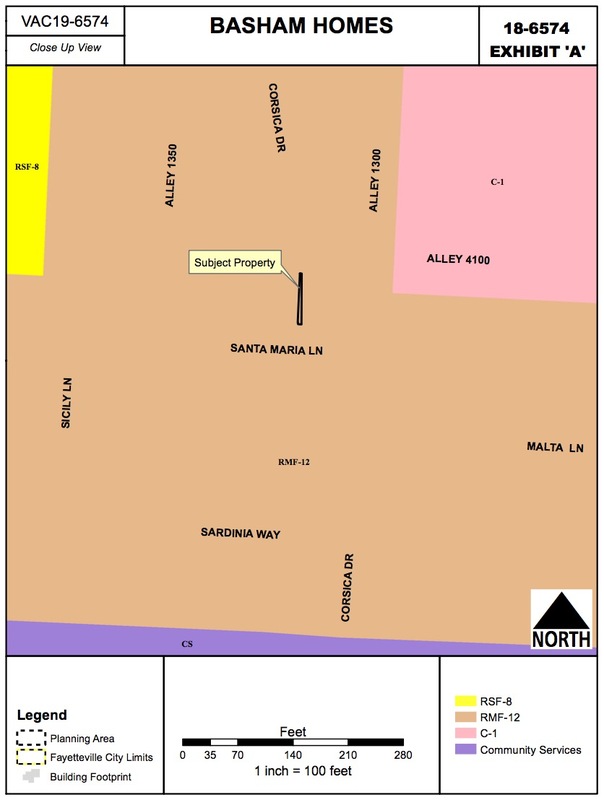 The property is located at the corner of Corsica Drive and Santa Maria Lane. 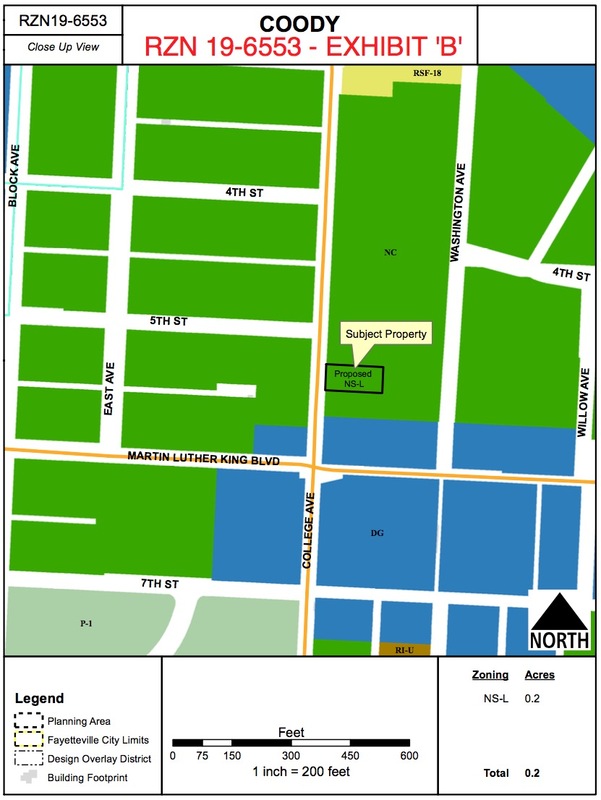 It is zoned RMF-12, Residential Multi-family, 12 Units per Acre and is currently undergoing construction for a duplex. An ordinance to amend Amend Article XXII Arts Council in Chapter 33 Departments, Boards, Commissions, and Authorities of the City Code to provide that one member of the Arts Council shall be a City Council member appointed by the mayor. The Fayetteville Arts Council currently has nine members, all of whom are appointed by the City Council. The proposed amendment would change the composition of the Arts Council to eight members appointed by the City Council and one City Council member appointed by the mayor. All nine members would have full voting rights on the Arts Council. One of the current nine members has indicated she cannot serve out her term due to work travel requirements. As such, there will be a vacancy created that can be filled immediately on the effective date of the ordinance. Mayor Jordan has stated that Council Member Sarah Marsh will be appointed to this position if the ordinance is approved. Staff said a City Council member on the Arts Council would bring a voice to the organization that was previously not available – namely someone who has a closer relationship with city funds, which are sometimes used for public art projects and someone who is at least seemingly more accessible to the public. Council member Gutierrez said she really likes the idea because it shows that the city prioritizes art. An ordinance to amend § 33.361 Composition of Article XXIV Town and Gown Advisory Committee of the Fayetteville City Code to add the president of the University of Arkansas Graduate Professional Student Congress as a member. The committee serves as a forum for collaboration between the City of Fayetteville and the University of Arkansas on mutually relevant issues. The committee advises and makes recommendations on a periodic basis to both the City Council and the University of Arkansas. Since it was formed in 2012, there has been one seat filled by the University of Arkansas Associated Student Government. Last year, the university added a graduate student organization to the Arkansas Student Government (ASG) structure. The student organization elects a graduate as president each year as does the ASG, an undergraduate group. City staff said there are unique points of view that come from both student organizations and would like to be inclusive of each. An ordinance to amend § 166.08(g) Non-conforming Access Features to require access management improvements upon expansion or improvements costing greater than 50% of the market value of a property rather than the assessed value. Current city code requires retrofitting to current access standards when the proposed improvements equal 10% percent or greater of the market value of the property as determined by the County Assessor. City staff said the low threshold does not meet typical “proportionality” tests and has resulted in frequent and unnecessary requests to the Planning Commission for variances. While the Planning Commission typically grants these types of requests, staff said the low threshold creates delays and uncertainty and discourages “highly desirable” investment and redevelopment of existing buildings. A recent example is the proposed renovation of the Chancellor Hotel (set to become a Graduate Hotel). The city’s Building and Safety department is reviewing a building permit to allow a $3 million renovation of the existing hotel, but the building permit cannot be granted without a variance because the renovation exceeds 10% of the assessed value of the building and the access to the street for hotel guest drop-off lanes doesn’t meet current access management standards. This amendment proposes to change the threshold to 50% of the assessed property’s appraised or market value as established by the Washington County Assessor. – The next bulky waste cleanup is April 27 at Vandergriff Elementary. – Residents and other interested parties are invited to a public input meeting about the Centennial Park Master Plan from 4:30-6:30 p.m. on Wednesday, April 17 at the Owl Creek School. This meeting was adjourned at 7:44 p.m.